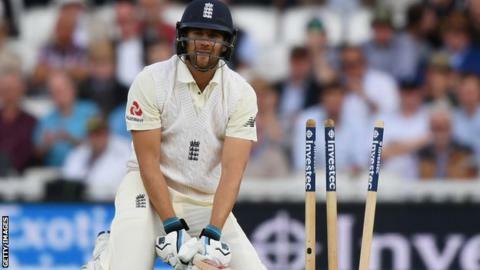 England can stiffen their brittle batting by using Australian conditions to plot their way to Ashes victory, says former captain Michael Vaughan. England's batting has long been an issue, including 12 openers being tried since Andrew Strauss retired in 2012. Mark Stoneman, James Vince and Dawid Malan fly to Brisbane as Ashes novices. But Vaughan said: "Australia, of all the places you play as a batsman, is one where you can sit in your room the night before and plan your innings." Vaughan, who led England to Ashes victory in 2005, says England's batsmen must initially play carefully before capitalising on the flat pitches as the ball loses its shine and shape. "In India, you're not too sure whether the ball will swing up front, and it will spin. In Australia, you know that for 20 overs, the Kookabura ball will swing," he said on The Tuffers and Vaughan Show. "After 20 overs, it doesn't swing. It goes dead straight up until that second new ball." England won the 2010-11 Ashes in Australia 3-1, but were whitewashed 5-0 on their tour there three years later. The batting was a huge problem on the 2013-14 tour, with Kevin Pietersen England's highest run-scorer with 294 runs from five Tests and Ben Stokes making their only century. England fly to Australia on Saturday to begin their defence of the Ashes, with the first match of the five-Test series beginning in Brisbane on 23 November. They have traditionally struggled at The Gabba, last winning an Ashes Test there in 1986 and losing by 381 runs four years ago. Vaughan believes captain Joe Root and former skipper Alastair Cook must help inexperienced players such as Stoneman, Vince and Malan prepare for an onslaught in the opening Test. "Australia are renowned for hitting England, or any team hard, at Brisbane," added the 42-year-old. "That will be the talk from the senior players to these guys that haven't been there and faced that kind of cauldron. It will be down to them to prepare them. "If their batting line-up doesn't fire and the bowlers get on top in Brisbane, it could be a long tour."